Three million gallons of liquid manure spilled from a dairy farm and into a nearby river, creating a smelly flow that was blamed for the deaths of thousands of fish. What is the cost of the lost fish? A few years ago I was sitting in a hotel conference room at 7:00 a.m (no joke) waiting for the annual meeting of the Socioeconomics Section of the American Fisheries Society to commence. When it came time for new business, Wayne Davis, a biologist with the Kentucky Department of FIsh and Wildlife Resources, raised his hand and wondered when the section was going to update its fish kills valuation handbook. In 2000, a fire destroyed a seven-story Wild Turkey warehouse in Anderson County, causing a spill into the Kentucky River that left hundreds of thousands of fish dead for 66 miles. Wild Turkey paid $256,000 to the state. This book is an update and expansion of the widely accepted monetary values of fish that have been published by AFS since 1975 (last updated in 1992 as Special Publication 24). This publication has been adopted as the legal basis for restitution or fines in more than half the states and has been upheld in numerous legal challenges. In this current version, freshwater mussels are included for the first time. 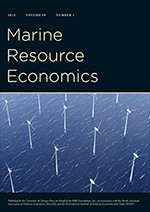 The publication contains comprehensive methods for assessing fish kills and freshwater mussel kill events and for assessing restitution based on replacement cost for organisms lost in the kill. Tables containing updated replacement cost values for most major fish species that are cultured and for all freshwater mussel species in the USA are included. This book is a must for anyone involved with fish or freshwater mussel kills, propagation, and water pollution policy. This past year, Wayne and Rob have traveled the country giving workshops to various meetings of the AFS chapters on how to use the handbook when there is a fishkill. I hear it is a good show. Wayne tells some Wild Turkey jokes. The approach to fish kill valaution is the replacement cost method. What is the cost of raising fish in a hatchery and putting them in the water to replace the dead fish? It is not the theoretically preferred method of valuing the costs of a fish kill but it does provide a lower bound. Now suppose that 100,000 fish died, 20,000 each from these species. The total replacement cost is $105,000. Not so much. Like I side, replacement costs give you a lower bound. From the sound of the Black River story, I'm sure the dairy farm that did the damage would be quite happy to pay $105,000. But I bet that theyl end up paying more.